Boxing training covers a myriad of things. There are lot of components to it. You cannot be one dimensional. Training for boxing and for health has intermixed. Though I cover both, this article is about how to get fit for the ring and competition. However those techniques in and of themselves also promote fitness. If you are not interested in the history or the techniques and just want to get right to the workouts see our favorite boxing program. You can also try CrossFit. 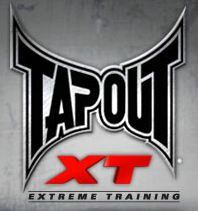 Though not specific to any one sport, it is a great base for MMA and boxing. 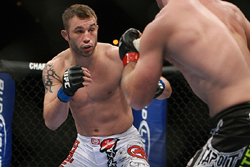 It differs from the program above as it is general fitness not tailored to MMA. At the end of the 19th century and during the early part of the 20th century, the notion that you boxed solely for self-defense, improved physical fitness, and character building was quite popular. There were even textbooks (very well written ones as a matter of fact) that taught the positives of conditioning and confidence building while also mentioning competition in the ring did not have to be the main goal for studying boxing. Then, for over 70+ years, the concept of boxing training as a hobby disappeared. It was not until the emergence of cardio kickboxing in the 1990s that led to the door being opened for boxing as a hobbyist pursuit. There are many reasons but one of the most oft cited is that boxing training improves conditioning, reduces body fat, and increases lean muscle mass. This should come as no surprise since many of the training methods associated with developing a boxer are designed to lay the foundation for the proper fitness to compete in a ring. You may not think that you have a reason to learn about boxing, much less use it in your training. Chances are though...that you are wrong! Even if you are stictly into MMA and have no plans to box, boxing can still be a good base for the mixed martial artist. Boxing can greatly improve your power and your punching techniques as well. Cross training can benefit your cardio as well. While you are punching the heavy bag, you are building your cardiovascular system which has saved the day in the ring for many MMA fighters. Renzo Gracie, world renown Brazilian Jiu-Jitsu practitioner and instructor, not only teaches boxing at his gym, he integrates it into his Muay Thai teaching as well and compares the use of Thai pads to the use of focus mitts in boxing. Boxing consists of so much more than throwing and blocking punches. There are many levels of advanced techniques and it is a physically taxing sport as well. Boxing has been around a long time and most every MMA fighter can learn something from it. Clearly, a mixed martial artist can do well by learning the ins and outs of boxing and even incorporating some of the moves into the gym and even in the ring. Whether you are doing light running, jogging, or interval sprint training, "road work" is of paramount importance to developing your boxing training skills. Running in all its forms builds up endurance by increasing lung capacity. Boxing training in the ring or taking part in a boxing class is a cardio exercise. Supplemental cardio training such as running makes the ability to perform in the ring or class a lot easier. Seriously, the fun of boxing will often derive from your improvement in the sport. When your "wind" is strong, you will not have to deal with the fatigue that drags down performance. Though LSD (long slow distance) will build your base, you want to sprint, aka, intervals. You want to mimic that hard anaerobic feeling you get in the ring. This serves the same purpose as running with a few differences. First, the engagement of the hands to twist the rope adds mild development to the arm muscles. The bouncing up and down of the legs during a rope jumping session enhances the plyometric strength of the feet that aids in developing the bursts needed for footwork. Also, you are on the balls of your feet as opposed to being flatfooted. This is where the term "light on one's feet" derives and it is in inference to the ability to move and glide easily when boxing. Remember, boxing is all about footwork and mobility and jumping rope aids in developing this necessary skill. 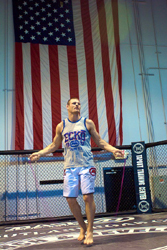 Every boxer and mixed martial artist should be jumping rope! Focus mitts are basically moving targets. They aid in developing the ability to hit a variety of combinations with speed and accuracy. Since the person holding the mitts is moving around, the person hitting can get a safe feel for what it is like to work in the ring. The trainer can drop the mitts and then raise them into a target position randomly as a means of devising reaction drills. Without a doubt, one of the most important pieces of equipment in a boxing gym is the heavy bag. There are scores upon scores of ways one can train with a heavy bag. Ultimately, all methods of training with the heavy bag teach the development of power and endurance as is related to heavy punching. This is where the term "digging into the bag" comes from. Another added benefit of training with the heavy bag in this manner deals with the development of a muscular physique thanks to the bag's impact on lean muscle mass. However, the speed bag should not be dismissed out of hand since it aids in developing hand-eye coordination and ensures you keep your hands up by your chin. The double end bag is similar to the speed bag but is designed in such a way that literal translations to the boxing ring are present. Accuracy and speed in hitting (usually with the jab-cross but other punches can be employed as well) are stressed with the double end bag. Since the speed of the bags return to the hitter is quite fast and a direct hit will lead to the bag following a straight line to the puncher, the bag is also used to develop defensive maneuvers such as slips, fades, etc. Needless to say the development of defensive moves has its value. The Maize bag is also commonly referred to as the slip bag which is primarily what it is used for. Of course, it is also used to fading, ducking, bobbing, and weaving. In short, this is an excellent bag for developing the offensive maneuvers needed to evade punches. You want to keep your hands out of defensive maneuvers as much as possible. BOB is a new invention of modern times. The way it works is relatively simple. 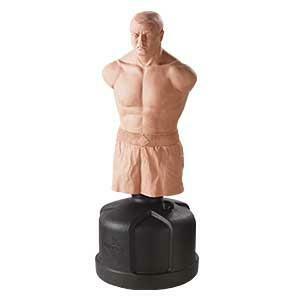 This is a variant on a light weight punching bag that is shaped in the form of the human torso and head. This allows for a more anatomically correct method of hitting the target which can come into play greatly when looking to develop accuracy. Such a hitting apparatus can aid in developing bare hand strikes common during the classic age of bare-knuckles boxing. There are other tools used in boxing training but these are the main ones. They also remain the most highly recommended of all boxing training equipment on the market since their value and benefits have long since been well established. Entire books have been written about medicine ball training. This is because the use of the medicine ball is extremely varied. In general, it adds weighted resistance and gripping strength to a variety of lifting and mobility exercises. This leads to enhances cardio, strength, and endurance which are all needed for proper boxing performance. 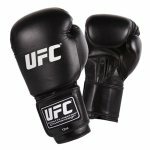 You can find the big items here at our Ultimate MMA Store. For some of the smaller items try Revegear. Or go to FW for free shipping inside the USA: Fighter Warehouse. The free shipping doesn't apply to big items like the bags.